Teas are the gentle, natural, most beneficial way to absorb the healing properties of herbs--easily and inexpensively. A simple cup of tea not only has the power to soothe and relax but to deliver healing herbal agents to the bloodstream more quickly than capsules, tinctures, or infusions. S'mores? In a Tea? Sure...Why Not? Summary : A unique rooibos tea that, unfortunately, had a rather weak flavor to it. You can taste a bit of "S'mores" in the tea, but the flavor wasn't nearly as strong as I was expecting. Review : I found myself hungry this evening. Yet, I hate eating things late at night, as you end up going to bed on a full stomach, which thus leads to you gaining weight. I also find I sleep better on a empty stomach than on a full one. Why? I have no clue. Still, I was hungry. So hungry I nearly grabbed a S'mores Granola Bar from Quaker Oats. But then I remembered! I had recently been sent a unique tea from the Little Snowbird Tea Company that was a S'mores Flavored Rooibos Tea. Talk about a perfect combination. So, in the spirit of keeping my slim waist line yet enjoying my S'mores, I eagerly ripped open the bag to give this tea a try. 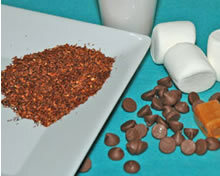 The S'mores Plus Tea from Little Snowbird Teas contains the following ingredients : Fair Trade Certified organic rooibos, natural and artificial flavors: caramel, chocolate, marshmallow. Here is how Little Snowbird Teas describes this tea on their website : "Bring back memories of that camping trip with this delectable tea, or take it with you on the camping trip... either way, it's sure to please!" Much to my amazement, this tea DID indeed have a moderate fragrance of S'mores to it right out of the bag. I'll confess, I was surprised about this, as it made me wonder "how do you make a tea have a fragrance of S'mores?" However, I found the flavor of this tea to be pretty weak in the "S'mores Department." Now, you could taste some S'mores in it, but the flavor was surprisingly weak, at least to me. I think the problem is that there simply isn't enough chocolate in it to "over-ride" the rather powerful flavor of the organic rooibos tea that is used. Still, this isn't a bad tea. Not by a long-shot. It just wasn't quite what I was expecting. Thus, I guess what I'm saying is that if you're looking for a true "S'mores Tea", I suspect you'll be somewhat disappointed with the flavor, as it is rather weak. Recommendation : Maybe. I tend to like strong flavors in my tea, so the weak flavor of S'mores was disappointing. I simply found the strong flavor of rooibos covered up most of the flavorings that had gone into this tea. Still, if you tend to like less strong flavored teas, you might like it. Brewing Instructions : Use 1 teaspoon of tea leaves. Pour 6 ounces boiling water over leaves. Let brew at least 5 minutes (7 used for this review). Art of Tea Cherry Amaretto Rooibos Tea : A pleasant but weak flavored rooibos tea that is no substitute for a cherry or amaretto flavored mixed drink. Culinary Teas Chocolate Mint Rooibos Tea : A superb tea that comes about as close to tasting like chocolate-mint candy as you'll likely find! Dragonwater Creamy Caramel Rooibos Tea : A disappointing rooibos tea where the flavor of caramel was mysteriously absent.